Breeding quality A.K.C. Companions since 1987. Owner and producer of a 41 Champions! 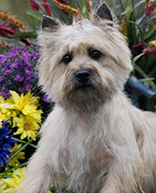 The Cairn Terrier, also known as the Cairn is a sensible, confident little dog, but friendly with everyone he meets. He is assertive, but cheerful and inquisitive. This breed is comical and quite the little clown. Guaranteed to make you laugh and smile with a variety of silly antics. Cairns are somewhat independent. Their intelligence makes them curious and extremely quick to learn. They are surprisingly sensitive and harsh punishment is not necessary or desirable. However, a Cairn must know from the start that someone else is in charge. If he has any questions about that, he’ll do his best to run the house himself. 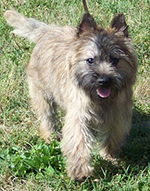 Firm, loving, and consistent discipline is the key to a good relationship with a Cairn Terrier. 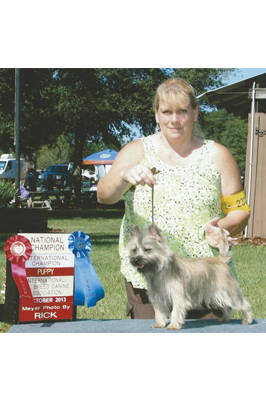 Obedience training is very beneficial to a Cairn and it’s owner. Cairns seem to have an inborn affinity to children. They are physically very tough and forgive or overlook mishaps and stepped on feet with characteristic generosity of spirit. They should not ever be teased or mistreated by children, and close supervision of small children and puppies is essential. 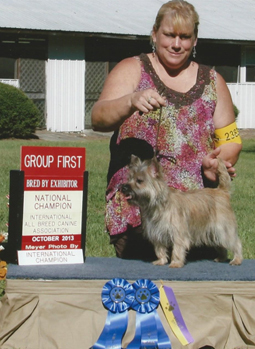 A Cairn thrives on attention and training and suffers from lack of it. Without training he will be bored and destructive. 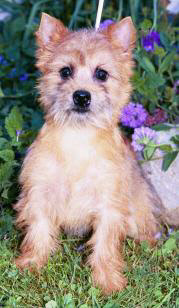 There is very little a Cairn cannot learn, if his owner takes the time to teach him. Because Cairns are highly intelligent, training sessions should be fun and challenging, not overly repetitious or boring. 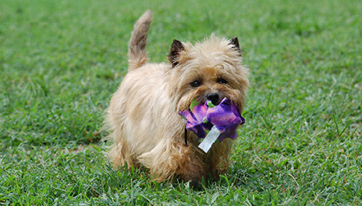 Cairns love to dig, and flower beds are hard to resist; don’t tempt your puppy by leaving him alone in a manicured yard. The Cairn needs rules to follow and limits to what they are and are not allowed to do. They do very well with a daily (pack) walk. 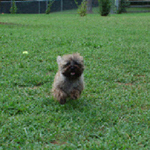 Do not allow this little dog to develop (small dog syndrome) a human induced behavior where the dog feels he is the pack leader to humans. This can cause varying degrees of behavioral problems, including, but not limited to, obsessive barking, guarding, separation anxiety, snapping and even biting. 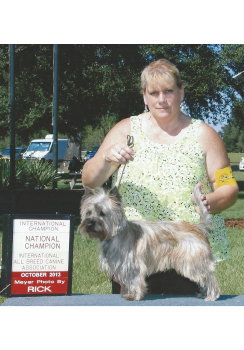 These are NOT Cairn traits, but rather behaviors brought on by the way the dog is treated. 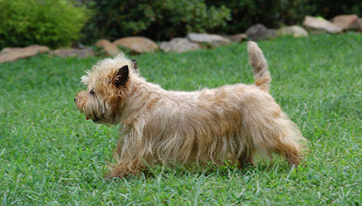 If you begin to be your Cairns pack leader, and are self-assured, calm, kind, and loving, but assertive toward the dog, the Cairn will be a very stable minded trustworthy dog. 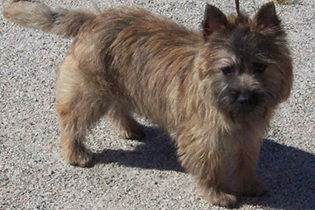 The Cairn Terrier may be found in apartments, suburban homes, or on a farm. Cairns are not suited to outside living. They are far more rewarding as pets when they live in close contact with their family. They simply adore their humans and love to show off for them with the games they play. 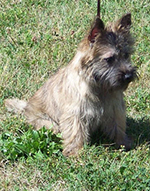 Being left “tied out” in an unfenced yard can be dangerous to the Cairn, as he in vulnerable to attacks by large dogs, as he is a little dog with a big dog attitude. The safest arrangement is a securely fenced yard. 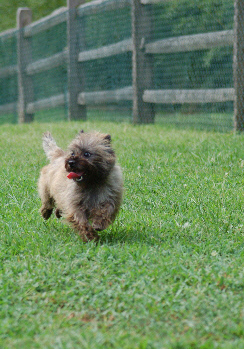 If there is no fenced yard, the Cairn MUST be exercised on a leash, as it is impossible to train a Cairn to resist the urge to chase squirrels, cats, rabbits, etc. (Remember, Cairns were bred to hunt) . Walking is an excellent exercise for Cairns and their owners. A brisk walk daily on a leash is ideal. From the Cairns point of view, the longer the walk the better. Cairns have natural ball-playing talents, and if you encourage it, you’ll have the perfect indoor exercise when the weather prohibits walking. 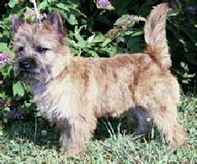 The Cairn Terrier comes in a variety of colors. All are attractive regardless of the color the Cairn turns out to be. It can be difficult if not impossible to predict adult color based on the puppy coat. Color changes in many Cairns continue for years, most brindles eventually becoming very dark, bordering on black. Some wheatens and reds also darken, while others remain light. 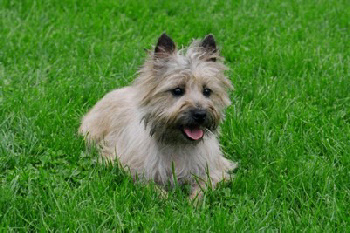 The Cairn is truly a big dog in a small package……small enough to carry easily, and to fit comfortable in your lap, but tough enough to enjoy romping with children. Their sturdy appearance makes them especially appropriate as a man’s pet; no man who has ever owned one was embarrassed by his “little” dog. 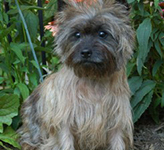 Cairns weigh approximately 13-14 pounds, and are basically a healthy dog. The Cairn can live 14 to 15 years, or more. 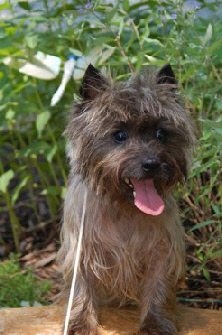 Alert, intelligent and long-lived, the Cairn tends to remain playful and active well into his teen years, endearing him to children. True to his heritage, the breed still has very large teeth, large feet with thick pads and strong nails (the better to dig with), strong, muscular shoulders and rears, and a fearless tenacity that will lead him into to trouble if his owners are irresponsible. 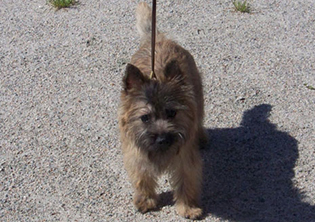 The Cairn is known as “Toto” on the Wizard of Oz…and rightfully so, because this sturdy little dog is everything a terrier was designed to be. He is strong, hardy, confidant, playful, silly, comical, up on his toes, and spirited. Overall, the Cairn is a carefree, happy, spirited, playful little clown that will give you years of enjoyment.